In August 2011, ethnographers Carolina Alonso Bejarano and Daniel M. Goldstein began a research project on undocumented immigration in the United States by volunteering at a center for migrant workers in New Jersey. Two years later, Lucia López Juárez and Mirian A. Mijangos García—two local immigrant workers from Latin America—joined Alonso Bejarano and Goldstein as research assistants and quickly became equal partners for whom ethnographic practice was inseparable from activism. In Decolonizing Ethnography the four coauthors offer a methodological and theoretical reassessment of social science research, showing how it can function as a vehicle for activism and as a tool for marginalized people to theorize their lives. Tacking between personal narratives, ethnographic field notes, an original bilingual play about workers' rights, and examinations of anthropology as a discipline, the coauthors show how the participation of Mijangos García and López Juárez transformed the project's activist and academic dimensions. In so doing, they offer a guide for those wishing to expand the potential of ethnography to serve as a means for social transformation and decolonization. 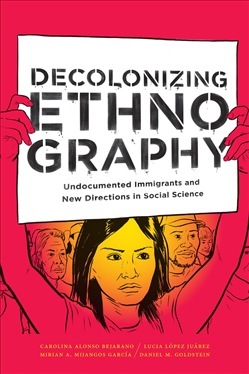 Acquista Decolonizing Ethnography in Epub: dopo aver letto l’ebook Decolonizing Ethnography di Daniel M. Goldstein, Carolina Alonso Bejarano... ti invitiamo a lasciarci una Recensione qui sotto: sarà utile agli utenti che non abbiano ancora letto questo libro e che vogliano avere delle opinioni altrui. L’opinione su di un libro è molto soggettiva e per questo leggere eventuali recensioni negative non ci dovrà frenare dall’acquisto, anzi dovrà spingerci ad acquistare il libro in fretta per poter dire la nostra ed eventualmente smentire quanto commentato da altri, contribuendo ad arricchire più possibile i commenti e dare sempre più spunti di confronto al pubblico online.